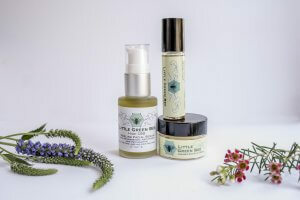 Little Green Bee, founded by a woman chemist and botanist, is our newest provider of high quality cannabis topicals. All of their products are hand-made in small batches and use the synergy of organic cannabis and other healing herbs to create Medicated Massage Oil for your aches and pains and two wonderful skin care products, Cannabis Eye Cream and High CBD Facial Serum, which work to fight the signs of premature aging of the skin such as oxidative damage from pollutants and the sun. Little Green Bee’s topicals are more concentrated than most on the market, and they aren’t overly perfumed. They are lightly scented with organic essential oils, which are also chosen for their healing properties. The science is slowly revealing that the active components of the cannabis plant, cannabinoids such as THC, THCA and CBD, are not only excellent topical pain relievers but their healing properties are extremely beneficial to the skin. Our skin is full of both cannabinoid receptors, CB1 and CB2 in the keratinocytes, sebocytes, hair follicles and sensory neurons. Here they act in the regulation of the homeostasis of the skin, keeping it healthy and beautiful. As an anti-inflammatory, cannabis can provide relief for skin conditions such as eczema and psoriasis and paired with its strong antioxidant capability, its use as an anti-aging beauty treatment is apparent. Cannabis added to your skin care regimen can help keep the skin smooth and supple and reduce the appearance of fine lines. New Product Announcement: Alchemy Cartridges	Farm Update!